Mid-October 2017, Nairobi was host to an intense engagement on housing rights, social justice and the right to the city. This was amid political turmoil in Kenyan towns and cities, and unrelated to this but largely unnoticed, a four-storey tenement building collapse in the western Kenyan town of Kisii, killing at least seven construction workers. The gathering in Kenya’s capital brought together members of the four-decade-old housing rights network Habitat International Coalition (HIC) and an aligned solidarity platform, the Global Platform for the Right to the City. HIC emerged out of a civil society initiative that organised in parallel to the first United Nations Conference on Human Settlements in 1976 (Habitat I). In 1987, at a meeting held at Limuru, near Nairobi, HIC transformed from a Council that represented NGOs, mostly in the First World, to a coalition of organisations in all regions, and including social movements. It refocused its work on habitat struggles in the Third World, operating from a Secretariat in the Global South. The Limuru Declaration of 1987 leaves no stone unturned, addressing pertinent issues such as the overlooked rights of women and the unhealthy tendency of NGOs to intervene in the affairs of community-based organisations. Veteran African organisations such as Environnement et Developpement du Tiers Monde (ENDA), in Francophone Africa, and Mazingira Institute, in Kenya, have committed three decades since Limuru to a HIC-aligned approach. The Global Platform for the Right to the City (GPR2C), though operational only since 2014, has its roots in the World Social Forums initiated from Brazil since 2001. Co-managed from Brazil and Mexico, it aims to strengthen national and local struggles and brings these together to influence the international development agenda. Most recently it lobbied for the inclusion of the right to the city concept in the New Urban Agenda, adopted at the UN’s Habitat III summit last year. In addition to the GPR2C imagining and promoting a new right to the city, HIC also launched its Human Rights Habitat Observatory (HRHO) at its October meeting in Nairobi. The HRHO is the culmination of the Coalition’s long-standing commitment and strategy to defend and further develop universal human rights standards related to human habitat. Adding to this longstanding commitment, the HRHO is an approach that responds to the new UN Sustainable Development Goals and, related to this, the New Urban Agenda, and insists on the application of the already-binding human rights obligations of states throughout the implementation of these current global policies. The HRHO, reflecting HIC’s equally long-standing commitment to the inclusive habitat approach, as defined in the Habitat Agendas, aligns with efforts that enable convergence of rural, urban and indigenous social-justice movements within the framework of codified human rights. It is no mere coincidence that this approach—indeed its name—is inspired, in part, by the Nairobi Civic Assembly’s 2002 declaration of Greater Nairobi as a “human rights habitat.” In this term, the concept of human rights converges with that of the right to the city. It is 50 years since French sociologist and philosopher Henri Lefebvre conceptualised “the right to the city.” Lefebvre first published this idea in a journal article in 1967, and expanded it in a book one year later. By 1969, the book had been translated into Portuguese and was published in Brazil. It appeared in Spanish in the same year. Beyond France, Spain and Portugal, the book inspired Latin American political movements struggling for democracy and social justice. The human right to adequate housing, resistance to evictions and displacements, promoting models for self-management of human settlements and wider “urban rights” have formed part of these struggles. At the height of Latin America’s dictatorships in the early 1970s, Lefebvre visited and spoke to banned political parties in Latin America and the social movements aligned to them. Related to their struggles he visited informal settlements or “favelas” [“shanty towns” in Portuguese]. In Brazil, the recent political turn away from the Workers Party to the right of the political spectrum, understood by many as a coup, has led to a rapid undoing of many of these legal advances. Associated to this, the state’s budget on social spending has been redirected. Latin America, and its struggles against political repression and closely associated, exploitative capital interests, remains a strong reference point globally in collective efforts toward more just countries, towns and cities. 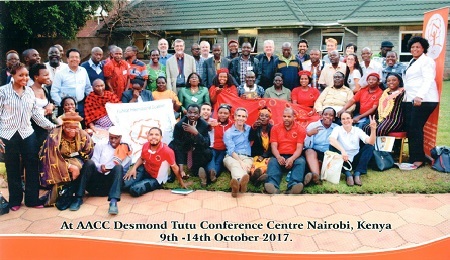 Fittingly, Kenyan co-host Steve Akoth from the Nairobi-based NGO Pamoja Trust opened the HIC and Global Platform workshop, on 9 October 2017, with a tribute to the struggle for social justice led by Ernesto Che Guevara, 50 years since his execution by the Bolivian Military, at the order of a CIA official. The right to the city is sought through peaceful means, though, out of necessity, often subversive or clandestine. Those engaged in protests and resistance that might involve occupations are often violently repressed. Activists on the ground, have faced assassination in their pursuit of a right to the city. Fatalities in South Africa’s largest social movement Abahlali baseMjondolo are a case in point. Six of its members participated in last week’s workshop as active members of the Global Platform. The right to the city, which is about ordinary people’s ability to inhabit, shape and enjoy their environment, linking the rural to the urban, is a political project. The notion of a right to the city unsettles the status quo of capital-driven spatial change. It is deeply unpopular in many powerful circles, and disliked by many governments. Proposals for its inclusion into the UN’s New Urban Agenda were among the most contested agenda items for nation states at the negotiation table. Political contestation is increasingly inseparable from the struggle for urban space. It plays itself out vividly in urban centres. In Kenya’s cycle of political contestation, Nairobi’s most symbolic public space, Uhuru Park, is the spatial locus of both ruling party and opposition demonstrations. It is estimated that Uhuru Park can fit 60,000 protesters . Protests staged here have included those against land grabbing, a blatant violation of individual and collective rights held in land, and one that has shaped much of the profit-driven vertical and horizontal expansion of Nairobi. In 1989, author, activist and the first African woman to receive a Nobel Peace Prize, Wangari Maathai staged a protest against the ruling party’s plan to construct a 60-storey commercial complex in a section of the park. In 2010, the launch in Uhuru Park of the new, democratic Constitution gave the nation hope of a less-violent, less-corrupt and less elite-driven future. But it is evident that neither global policy statements, nor the Constitution, on their own, can deliver this more-equitable future at the local level. The seven plus deaths from the four-storey residential building collapse in a wetland at Kisii, on 11 October 2017, was preceded in that town by ten deaths caused by the collapse of an unauthorised ten storey tenement less than a year before this. Tenement collapses in Nairobi have escalated in recent years. Rapid succession of fatal collapses in December 2014 and January 2015 ushered in a building inspectorate and building audit. For many subsequent building collapses, journalists have reported the officially unfit status of the buildings and the lack of action about this. Corruption has long been a factor in this equation. The most iconic collapse was yet to come in April 2016 with 52 fatalities. More have followed since. The gathering in Nairobi tended to focus on the many violations faced by those unable to afford rents in the tens of thousands of private multi-storey tenements rapidly spreading across the city and threatening to collapse. Displacement, dispossession and dislocation featured in many grassroots accounts. The meeting launched a campaign to stop forced eviction. Veteran Kenyan activist Davinda Lamba of Mazingira Institute explained that the last frontier of civil society in solidarity with social movements must be to deepen its involvement in the political decision-making process. This space is all too often occupied exclusively by private interests in capital accumulation, which in turn spawn many of the violations that the new observatory for a human rights habitat, the HRHO, intends to expose. As African NGOs and social movements organised to coordinate solidarity activities going forward, veteran HIC Member and environment activist Malik Gaye of ENDA in Senegal reminded that the “pacifist wisdom of Africa” has much to contribute to this global struggle.